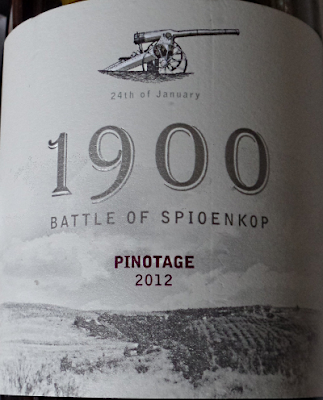 My Wine of The Month for June is Spioenkop ‘1900’ Pinotage 2012. At a tasting of premium Pinotages I recently presented, one of the attendees told me afterwards that he’d come to get an ‘understanding of what Pinotage is’, and he said he was leaving feeling just as confused as when he came. One of the delights of the variety is that there is no old-world region producing a template in the way there is for Pinot or Cabernet/Merlot etc, and so Pinotage can – and is – interpreted in many different ways. My seeker after the essence of Pinotage would have left even more confused had he been poured Spioenkop ‘1900’ Pinotage 2012. This was a Platter 5 Star wine in the 2014 Guide, praised as “Pinotage re-imagined”. With just 12.5% abv it feels light bodied, there’s a distinct perfume of violets on the nose with layers of sweet fruit on top with a short finish. It’s restrained, more Fleurie Beaujolais than Stellenbosch Pinotage. It’s agreeable with raspberry flavours, and although a nice wine I doubt it’d be identified as Pinotage in a blind tasting. Which would be an attraction to many, but, interesting as it is, it’s not my preferred style. 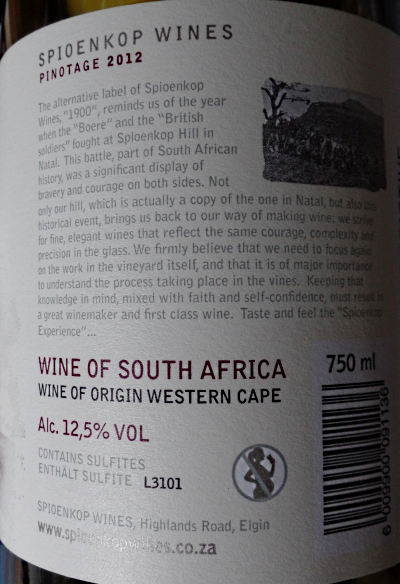 The ‘latest’ vintages listed on Spioenkop’s website are from the 2011 vintage, so there’s no information about this wine. Spioenkop’s ‘1900’ label is used for wines made from grapes source from outside winery’s Elgin location and refers to the year of a victory at Spionkop in Natal by the Afrikaners in the war with the British.